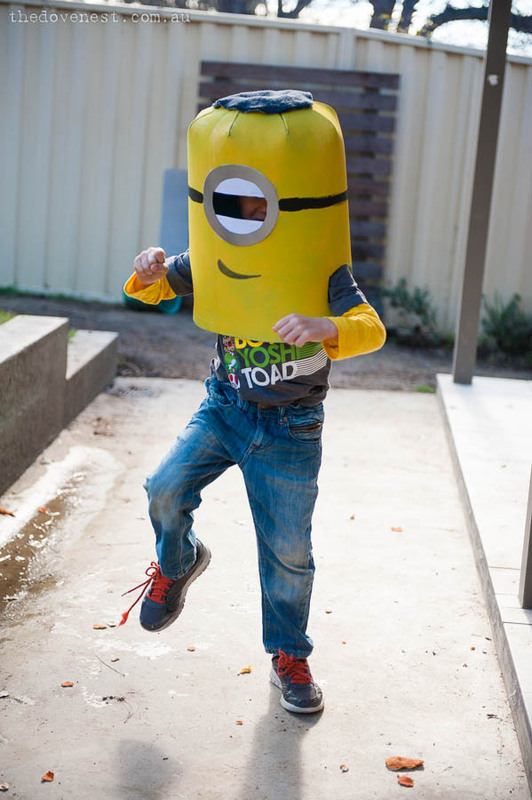 When I shared my last Project Life update, I realised I hadn’t really shared much about the minion costumes I made for the boys. I’m one of those mums who love making costumes (ohmygosh look how tiny my boys were! ), even if I do have a wee tendency to procrastinate and then stress myself out and have a late night the night before to get them finished. 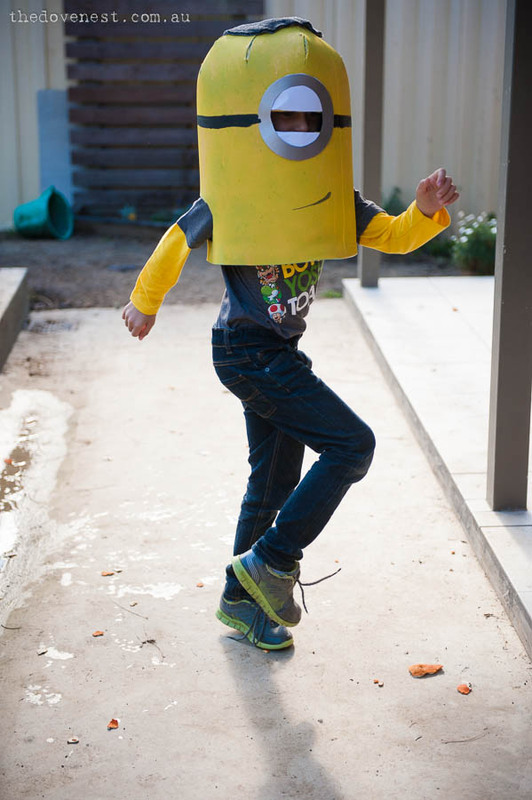 A while back, the boys had a dress-up day for school, and the theme was Despicable Me. 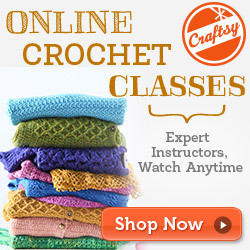 I did a quick Pinterest search, with lots of ideas, and this minion tutorial caught my eye. I had to make some adjustments due to the size of the camping mats we could find at BigW, and it took a few goes to get the tops to get shaped quite right. They still weren’t perfect because, due to the width of the mats, I couldn’t curve the foam all the way across the top of the head. A fuzzy handtowel as hair worked to cover the gap, but there was a limit to how much skin I was willing to sacrifice to the Great Hot Glue Gun in the name of the perfect Minion Head Shape. 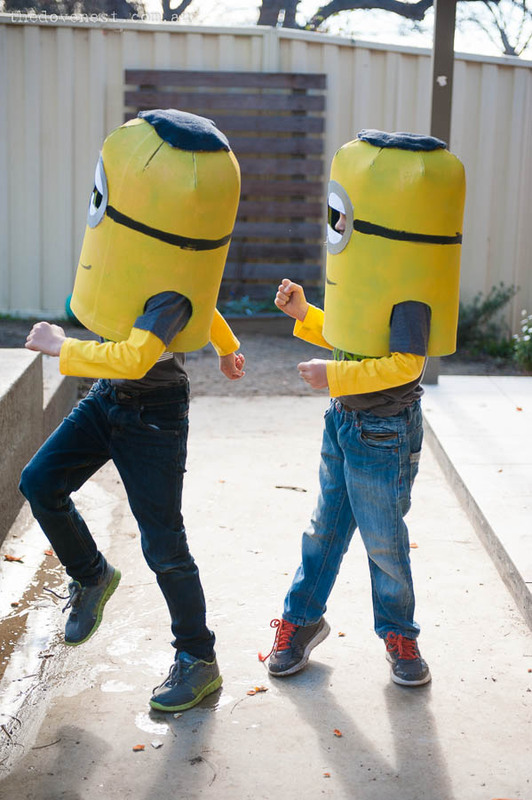 A lot of the shapework was done by eyeballing the shape and size, and slipping cylinders of foam on and off the boys to test the fit (I’m such a technical crafter like that), but the actual minion-ating of the costumes happened after they went to bed. The morning of dress up day, they got up. They raced to the kitchen. “Are they don ye…. MUMMY! MINIONS!!!!! !” Followed by a squeal, a general clamouring to try them on over the top of their pyjamas, and two very happy little minion boys. Ideally, I would have liked the paint to be more yellow, and a more complete coverage, but, as these things tend to go, it started raining pretty much bang on the time I wanted to go outside and spray paint them. Which I’m not complaining about, I promise, because rain is a precious commodity around here (and something we could use some more of right about now as we move into a stinking hot spring & some corker fire weather). But if it could have held off for even ten minutes, that would have been fab? Because we had to work really quickly to minimise the number of rain spots. If I could’ve gotten away with it, I would have tried for a second coat, but it was still bucketing down at 10pm when I’d finished all my other jobs and was ready to complete the decorating. I also kept the eyes a lot simpler than the original tutorial, because I knew the costumes were going to be on and off a lot, and shifting around the classroom, so I wanted to minimise the chance of “bits” getting damaged, and felt a flat eye would work better than the 3D version. 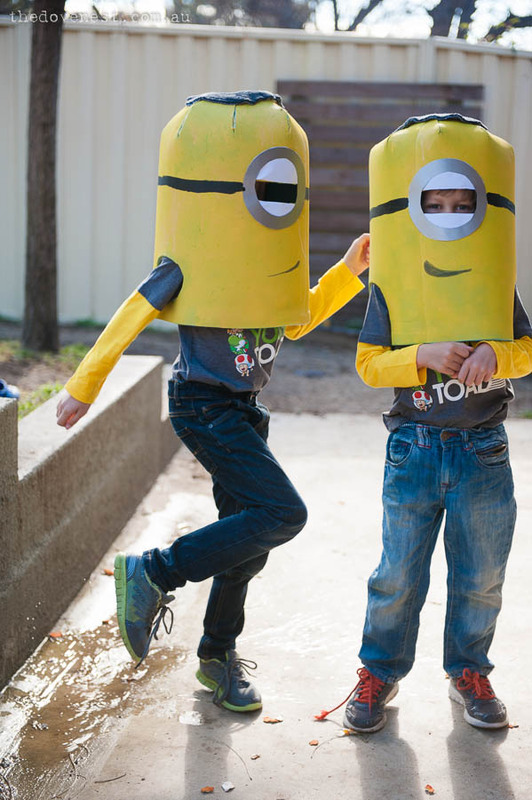 Two dorky minions = two very happy little boys! And no matter how much time they take, or how many fingerprints I burn off with hot glue, their reaction always makes it worthwhile. 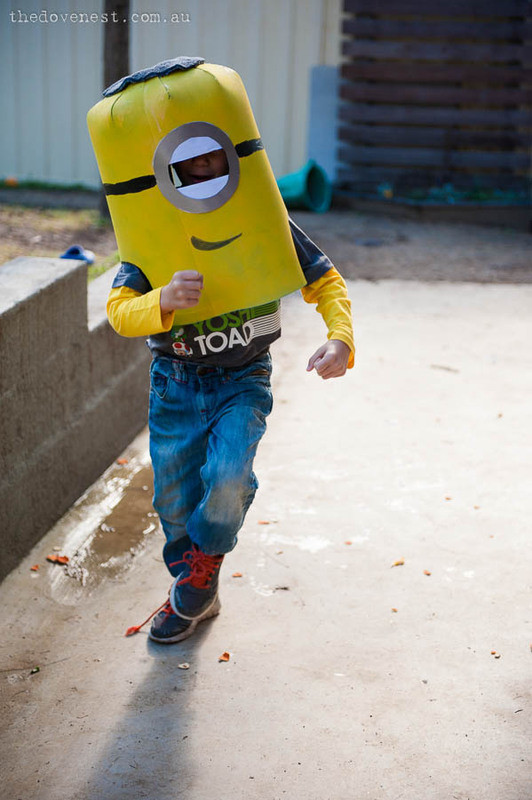 I want a minion costume now. make me a purple one??? YES I WILL. Camp gifty?